Caye Villas - Los Encantos "Our Belize Vacation" - "Our Belize Vacation"
Secluded, intimate complex of private homes each uniquely decorated by the owner. Each units main level is located on the second floor. 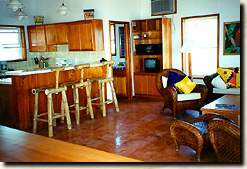 The main level has a fully equipped kitchen, living and dining area and a full bath. The ground level has two or three bedrooms and two or three baths. The living area and each bedroom have AC. Each unit also has satellite TV, VCR and stereo. Caye Villas is located approximately 5 miles north of San Pedro and are within walking distance of several full service resorts. Transportation to and from the San Pedro airstrip and maid service every other day is included. 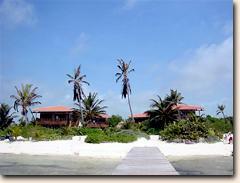 Four beautiful, private villas located 4.5 miles north of San Pedro Town. 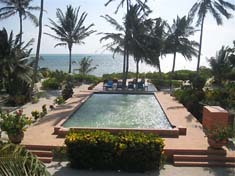 Villa 1 is three bedroom, three bath with three queen beds. It also includes satellite TV and internet connection. 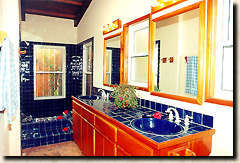 Villa 2 is a two bedroom, three bath with king beds in each bedroom. 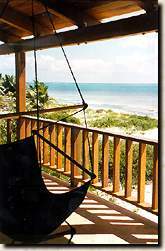 Villa 3 is a three bedroom, three bath with two king beds and two queen beds. It also has a separate apartment attached to the house that has a queen bed, living area, bath and full kitchen making it four bedrooms if desired. Villa 4 is a three bedroom with two queens and two single beds and a total of four baths. Each villa has VCR, stereo, AC and phone. Villa 2 and Villa 4 have satellite television. Los Encantos has a beautiful pool and private dock with a thatched palapa. 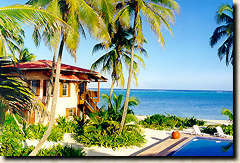 They are within walking distance of three resorts for dining and other activities. I would like more information about these properties. LOS ENCANTOS - Four (4) Private Villas, ocean front. Queen beds, satellite TV and internet connections. Two King size bed and two queen size beds.